We live in a punitive culture. We are so used to punishment as the go-to solution for any behavior we want to change, that it can be difficult to imagine other options. A group of artists, organized by Project NIA, are here to help us. When it comes to discipline and punishment, we seem to be reaching a tipping point. The number of people incarcerated in the US has become so outrageously large, that bi-partisan support (a rare thing these days) is building up behind criminal justice reform. People are (re)considering alternatives to incarceration, particularly for non-violent crimes. In schools, too, it has become clear that a largely punitive approach to dealing with behavior “problems” has only led to more problems. Schools hand out unconscionable numbers of suspensions and expulsions. 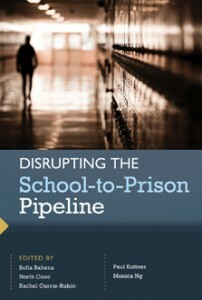 This disproportionately harms low income Students of Color, exacerbates the large opportunity gaps that already exist, and fosters what has come to be known as the school-to-prison pipeline. If this seems daunting, a new arts-based campaign offers a simple, but powerful, starting point. The effort was catalyzed by Project NIA, an influential Chicago-based organization dedicated to “participatory community justice” (which encompasses restorative justice as well as more systemic approaches like transformative justice). Project NIA brought together a group of (mostly) Chicago artists to create restorative justice posters. 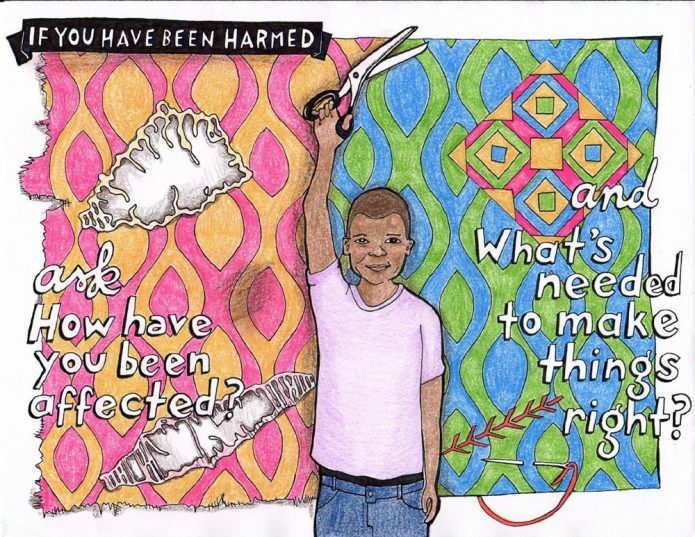 These stunning posters feature “restorative questions,” drawn from the work of Margaret Thorsborne. The posters, and the questions they pose, are deceptively simple. However, if we were to truly use these questions as our starting point to address crime, violence, and conflict, we would find ourselves veering far from the punitive path. To ask someone who has been harmed, “What is needed to make things right?” is to privilege healing over retribution. To ask someone who has done harm, “Who do you think has been affected by what you did?,” is to assume that learning and growth are possible. All posters are available for public download. Print out your favorites and hang them in your neighborhood. I’m definitely going to be putting some up in the schools I work with here in Salt Lake City, where restorative practices are just beginning to gain traction. If you take a photo of the posters you hang, you can share it with the project by emailing it to transformchi2013@gmail.com.